QUADRANT SILICONE-Series Thermal Oxidizer's QUADRANT SRS Thermal Oxidizer's are an example of Catalytic Products International's continuous improvement capabilities. The QUADRANT SRS is our answer to industry requests for a more rugged and durable thermal oxidizer – especially designed to process emissions from the silicone coating industries. The QUADRANT SRS takes advantage of the proven success of the QUADRANT SR Thermal Oxidizer line, and uniquely modifies the flows to maximize silicone cleanability and uptime reliability. Catalytic Products International, Inc designs each QUADRANT SRS Thermal Oxidizer based on the exact needs of your application. With 48 years of thermal oxidizer design as a basis of our expertise, you can be assured that your QUADRANT SRS Thermal Oxidizer will be designed with the most appropriate features for your needs. The QUADRANT SRS Thermal Oxidizer is an economical solution to applications in the silicone tape coating, release liner, adhesive coating, and other processes that use silicone in the manufacturing operations. Silicon is a necessary additive for various coated products. Silicone is vaporized in the drying process that forces a large percentage into the dryer exhaust. Silicone when heated above certain temperatures will form an inorganic particulate - Silicon DiOxide (SiO2) SiO2 clings to hot metallic surfaces and forms a destructive and efficiency robbing barrier layer. SiO2 will poison catalytic oxidizers. SiO2 can effect RTO valving and clog ceramic media. SiO2 will create boundary layers in typical shell and tube heat exchangers. Engineered cleanabiilty Easy access Fast and effective clean-out Automatic Notification Cleaning tools to speed up the cleaning operation. Among the air pollution control choices available to consider; Catalytic Oxidation, Thermal (recuperative) Oxidation, and Regenerative Thermal Oxidation, all are susceptible to operational problems of one kind or another. The basis for these problems stems from the oxidation process itself. During operation of the production source, silicones are driven off along with the VOC's. Since the air pollution control equipment is installed to destroy the VOC's, any system has to be designed to also process the silicone vapors. During the oxidation process, silicone will convert to silicon dioxide (SiO2). This (SiO2) is the culprit for failing and/or under-preforming air pollution control equipment. The SiO2 is a talcum-powder like substance that clings to metal surfaces, robbing any system of efficiency and putting at risk the system's ability to effectively destroy VOC's. Thermal treatment of VOC's and other air pollutants works by a simple reaction of the harmful air pollutants with oxygen and heat. In this environment the VOC's are converted to harmless inert byproducts, water vapor (H2O), and usable heat. These harmless by-products are released to atmosphere or use an energy recovery technique to further lower the operational costs. QUADRANT SRS Series Thermal Oxidizer's are considered among the world's most advanced recuperative thermal oxidation systems. These specially designed and proven systems combine the basic principles of time, temperature, and turbulence to the fullest extent possible. 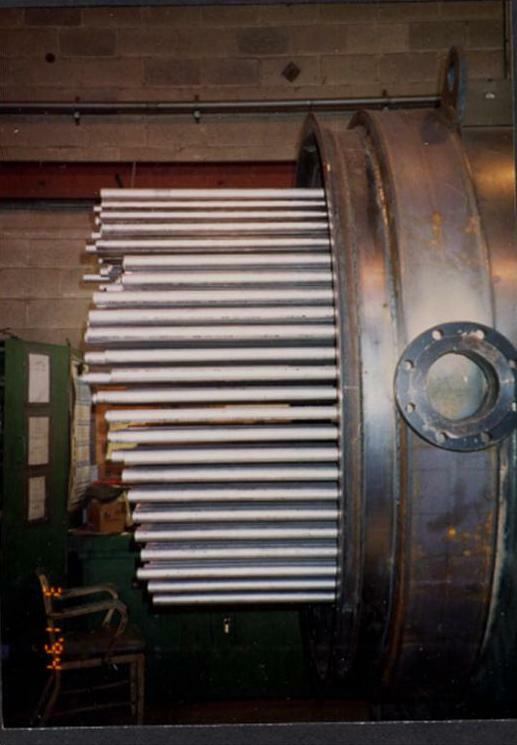 The resulting effects provide you with exceptional performance, substantially reduced operating costs, and industry-leading reliability. The QUADRANT Thermal Oxidation process begins with a booster fan designed to draw the volatile organic compound (VOC) laden process exhaust to the QUADRANT System. From there, the VOC and Silicone-laden process air stream is then directed to the FLOATING TUBE heat exchanger shell side, thus there is never any build up on the outside of tubes. This unique design pinpoints the tube velocities to minimize buildup and specially designed plenums force drop-out and easy access for vacuum removal. When the stream enters the FLOATING TUBE heat exchanger, it is continuously preheated at close to the ignition temperature before being sent to the pre-heat burner. The exchange of energy in the primary heat exchanger makes up the basis for fuel savings and economical operation. A pre-heat burner is used to precisely maintain the combustion chamber operating temperature. 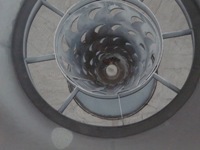 The burner is designed to promote mixing of the exhaust gases with oxygen when fired through our specialized combustion system. This innovative design provides the highest degree of flame impingement and high-velocity mixing, leading to airflow and temperature uniformity for which QUADRANT Oxidizers are known. The contaminated air stream next passes through a specially designed combustion profile. The combustion profile works like mixing baffles to create turbulence and improves mixing, helping to prevent temperature stratification. From there the air stream enters the dual pass combustion chamber to assure proper mixing of all the effluent constituents. Even at low flow conditions, this mixing action provides the highest possible temperature uniformity for industry leading destruction ability at the lowest operational cost. Once mixed the air stream is held in the dwell chamber long enough to ensure complete combustion of the VOC's. Here the Silicone is converted to an inorganic particulate in the form of Silicon Dioxide (SiO2) From there the particulate laden air stream is directed into the tubes of the FLOATING TUBE primary heat exchanger. In the FLOATING TUBE primary heat exchanger the hot gases provide the energy transfer to the incoming gases and the SiO2 will begin to cling to hot metallic surfaces. By allowing the buildup to occur inside the tubes, a special tube cleaning device can be used to quickly clean the heat exchanger and restore the thermal efficiency to the original design. The cleaned exhaust is discharged to the atmosphere or to auxiliary heating systems such as; secondary air to air recovery, air to water recovery, air to oil recovery. Catalytic Products International continues our 43 year history of providing customized innovative air pollution control equipment by offering our QUADRANT SRS-Thermal Oxidizer Systems. Catalytic Products International has been designing and manufacturing QUADRANT Self-Recuperative Systems now for over 30 years. The evolution of the QUADRANT SRS system is an economical solution to applications in the silicone tape coating, release liner, adhesive coating, and other processes that use silicone in the manufacturing operations and provides our users with the highest VOC destruction, lowest combustion chamber temperatures, and longest life. No other supplier of recuperative thermal oxidizers can match our extensive knowledge or equipment performance. All QUADRANT SRS-systems incorporate a proven round design which protects against stress and fatigue commonly found in other systems that utilize an antiquated "square box" design. Damaging thermal-mechanical stresses inherent in every thermal oxidizer are eliminated with the QUADRANT SRS-Thermal Oxidizer and its round design.The modular design removes the heat exchanger from the combustion chamber to allow each component the ability to individually control growth. The modular design is key to long equipment life and the highest uptime reliability. 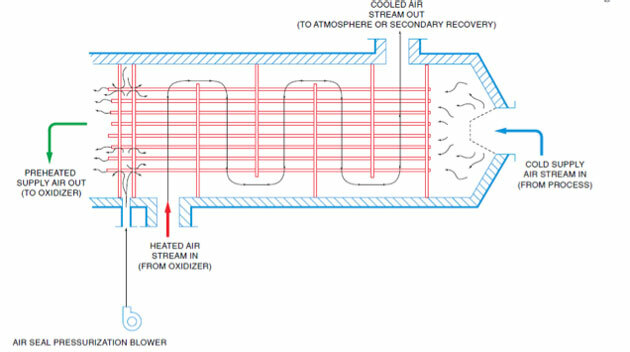 All QUADRANT SRS-Thermal Oxidizers incorporate a specialized internal insulation system designed to retain heat for low cost and cool shell temperatures. The internal insulation works in conjunction with the round design to eliminate shell growth for industry leading uptime reliability and low maintenance. The advancement of internal insulation is just one of the continued enhancements that we have introduced, all in an effort to provide longer lasting equipment with lower overall operating costs. 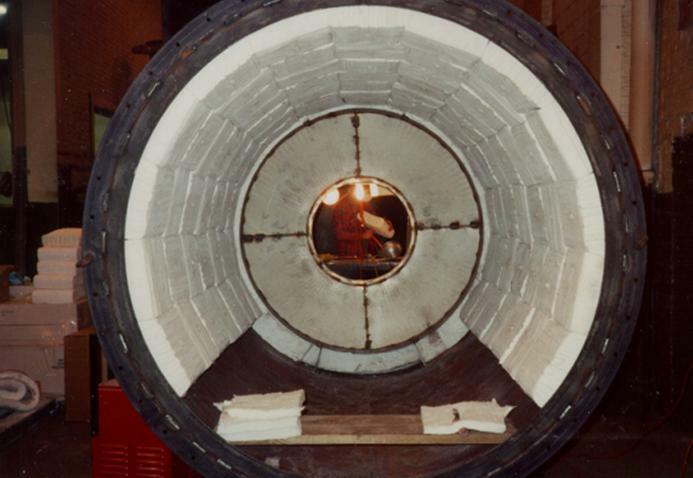 Our introduction of the Floating Tube Primary Heat Exchanger back in 1983 is the single most important advancement in recuperative technology. Antiquated systems that incorporate expansion joints or packed seals provide users one assurance, failure. This simple known fact is the basis for our introduction and continued use of the Floating Tube Primary Heat Exchanger. This design eliminates thermal stress and fatigue by allowing each individual tube to expand and contract at it's own rate. No one else has this proven technology, no one else can match the stress free durability, no one else has the application experience to meet your needs. One of the most unique features found in any QUADRANT system is the design of the combustion profile coupled with the preheat burner. This paring of components has paved the way for QUADRANT systems to operate at the lowest temperatures while providing the highest VOC destruction. Faced with today's compliance requirements the old design strategies of time and temperature are not enough. Only the QUADRANT system, by maximizing turbulent mixing, flame impingement, and temperature uniformity can assure users of low cost - ultra high destruction. The preheat burner in every QUADRANT system is selected based on the exact needs of your application. Whether your application calls for nozzle mixing due to low oxygen, raw gas for energy savings, low NOx for compliance needs, or multi-blend fuel types, QUADRANT systems provide flexibility for any project. Every QUADRANT system is integrated to our customized PLC-control panel called TSS. TSS communicates with the QUADRANT system and your process for optimal performance, safety, and reliability. TSS optimizes fuel efficiency by managing temperatures, controlling drives, and positing valves. This user friendly system provides automated operations, one button start-stops, self diagnostics, and data monitoring options for simplified maintenance and compliance verification. Catalytic Products International, Inc. has vast processor experience and can integrate any industrial processor into your operations.